Construction projects usually have many steps. If the project includes demolition of any kind, such as during a remodel or renovation, there will be a lot of waste involved. Even a job site that involves only a build will have a lot of building material waste. It usually is the construction crew's responsibility to remove the waste from the site. Renting a dumpster is the most sensible and responsible way to remove this debris. Dumpster rentals provide space in which to collect the trash and make for an important addition to any work site. Dumpsters provide a safe, organized means for disposing of materials on a construction site. Most people do not think about dumpsters until they need one. However, people use dumpsters every day. Workers on a construction site typically use dumpsters because the trash material on a work site is more substantial than what can be thrown into a regular trash can. In the mid-1930s, the Dempster brothers saw a need for an extensive trash collection system. Standard trash receptacles were designed to be small enough to carry. When people collected more trash than could fit in the household receptacle, they left it in heaps in the neighborhood until a vehicle could come pick it up. To help solve this problem, the brothers created a large, movable trash bin they called a dumpster. Dumpsters come in many sizes and can be placed in many locations. The most common type of dumpster is a roll-off dumpster. It has unique wheels that allow it to be put in place and taken away when full. The type of dumpster will determine what you can place inside. Most dumpsters cannot contain hazardous materials of any kind. When dealing with construction project waste, your most practical option is to rent a dumpster. For most companies, it makes little sense to buy a dumpster that fits one project only to have to buy a different type of dumpster for another project. Sometimes the dumpster you need for one project is too small or too big for another project. You can typically rent a dumpster from BigRentz for 28 days. Dumpsters come in many sizes. The size you need depends on the amount of debris you will collect. Dumpster sizes are measured by the cubic yard. This number indicates how much material the container can hold. When renting a dumpster, also consider the kind of content you will be putting in it. While dumpsters can hold most types of trash except hazardous waste, you typically can't combine different types of materials. The ideal size when renting a dumpster is one that is large enough to hold all your waste materials but not bigger than needed. If the dumpster is not big enough, you might need to rent another dumpster or empty the dumpster more often, costing more money. If the dumpster is too large, you'll be paying more than necessary. Cubic yards are a measure of volume. A cubic yard is 3 feet long by 3 feet wide by 3 feet high. BigRentz offers dumpsters in several sizes. Small dumpsters are best used in less sizable projects. If you're working on a project such as clearing out a garage, basement, or attic, then you'll want to rent a 10-yard dumpster. These have a weight range of 1 to 3 tons and hold the equivalent of about three truckloads of materials. The next size up carries a little more. The 15-yard dumpster has the same weight capacity as the 10-yard but holds about 4.5 truckloads of materials. Mid-sized dumpsters are ideal for substantial rennovation projects, such as roofing and lansdcaping. The 20-yard dumpster sits right between the more substantial large dumpster and standard personal dumpsters. 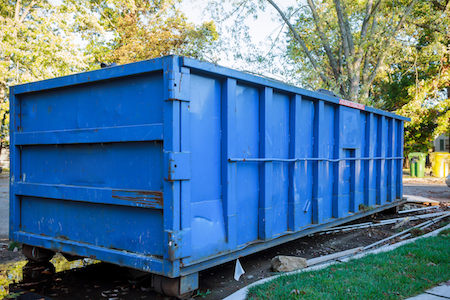 The 20-yard dumpster is great for deck and floor removals, roofing jobs, or big landscaping projects. Twenty-yard dumpsters have a weight capacity of 2 to 4 tons and hold about six truckloads. Large dumpsters provide immense amounts of disposal space for large-scale construction jobs. The 30-yard dumpster is where we start to get serious. Sporting a weight capacity of 2 to 4 tons, this dumpster can haul about nine truckloads of whatever you need to remove from your work site. The 30-yarder is useful for new home construction and whole-house cleanouts. When you need even more waste collection, select the 40-yard dumpster. It holds about 12 truckloads. Each of these dumpsters can be narrowed down further by construction material, such as residential, construction, and dirt. You have several options when it comes to types of dumpsters to rent. The kind of dumpster you need will depend on what you'll be using the dumpster for. 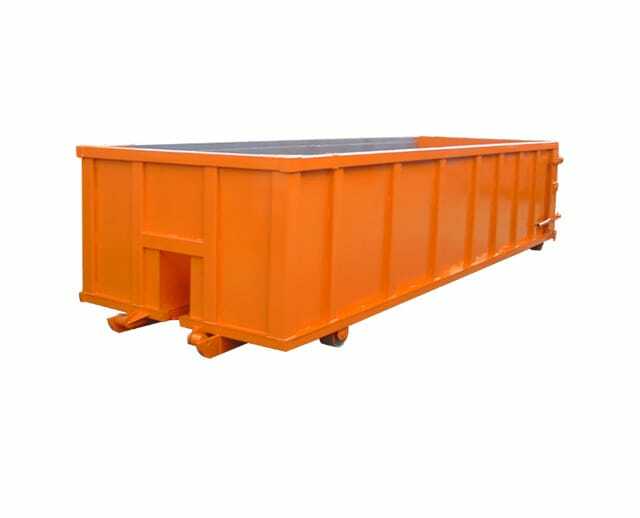 A construction dumpster is a common name for the roll-off dumpster. This open-topped dumpster can be used for almost anything, not just debris removal. A construction dumpster is the best solution for any cleanup job that needs a temporary dumpster. A roll-off is the most common dumpster rental for construction sites. A roll-off dumpster has unique wheels that allow the dumpster to move into place and roll away once full. A large truck usually brings the dumpster when it is rented and will take it away when needed. The trucks typically take the dumpster, filled with waste, to a landfill or recycling center. A roll-off dumpster has a simple design. The top is open making throwing debris in it simple. A large swing door on one end opens, making it easy to load heavy or bulky materials. There are feet or rollers on the bottom. Depending on where you place the dumpster, we can put wooden planks down to protect the ground. 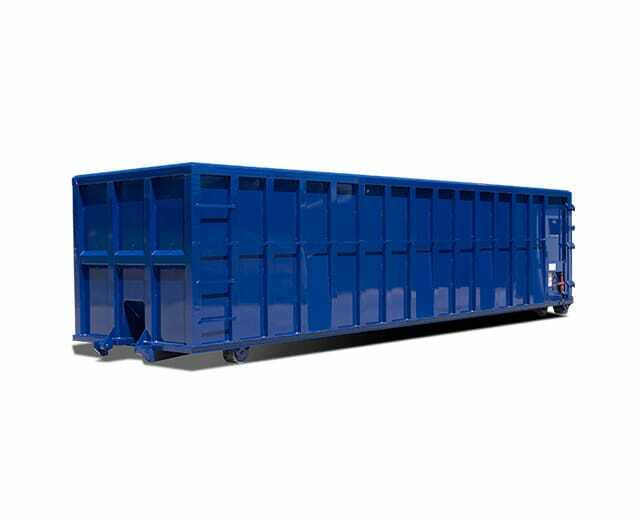 The size dumpster rental you need depends on the size of your project and the material to be dumped inside. 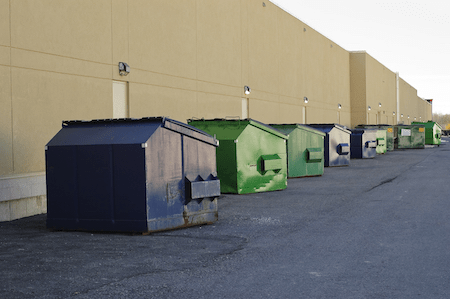 Commerical dumpsters can be found at business establishments across the nation. Trash dumpsters are the common name for commercial business dumpsters. These are the regular trash dumpsters you find behind businesses such as gas stations, restaurants, apartment complexes, etc. These are permanent containers that have scheduled pickups, usually weekly, biweekly, or monthly. These trash containers have lids to reduce odors, deter pests, and keep out rain or snow. When considering a dumpster service for long-term use, think about recycling options, contract terms, and the equipment needed, as well as price. For most people looking to rent a dumpster, a roll-off dumpster is sufficient. It is important to adhere to what you can place in a dumpster safely in order to avoid a potentially dangerous situation. While it might seem like you can throw anything in a dumpster rental, this is not the case. Some people think they can just shove anything in the dumpster and forget about it. It is extremely important to know what you can and cannot toss in it. The type of dumpster you rent will determine what you can safely put in it. Generally, household items such as housewares, personal items, and clothing can go in a dumpster. 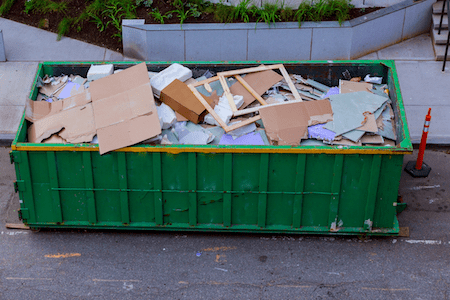 Remodeling debris such as drywall, lumber, cabinetry, flooring, and siding are all acceptable things to put in the dumpster. Some appliances can go in a dumpster. It's usually OK to throw microwaves, stoves, and dishwashers into a dumpster. Some areas allow electronics, such as TVs, computers, printers, and cell phones, to be thrown into a dumpster. In other areas, there is an additional fee for these items. You might be allowed to throw certain types of furniture in the dumpster. Wooden furniture is usually OK, while upholstered furniture might not be. Yard waste is generally allowed in a dumpster except for tree stumps. These are prohibited from landfill disposal. 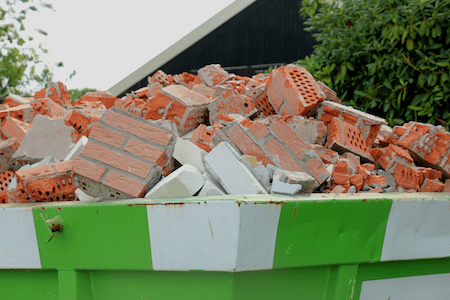 Heavy construction materials, such as brick, asphalt, and concrete, are accepted in construction dumpsters but are usually not allowed in large amounts in residential dumpsters. You can place empty aerosol cans in a dumpster. Do not, however, put cans that still have liquid inside, whether full or partially full, in the dumpster. Batteries such as AAs and Ds can be thrown out in the dumpster. These are generally accepted materials. Different areas, however, might have different regulations. When renting a dumpster in your area, first ask if this list is acceptable. What Shouldn't go in the Dumpster? 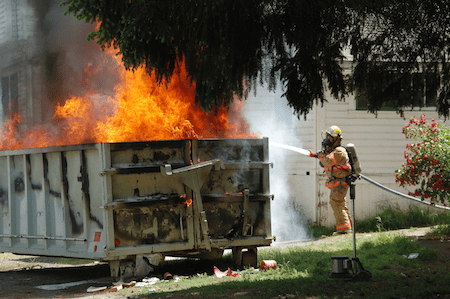 If proper safety protocol is not followed, disasters like a dumpster fire can occur. Appliances such as refrigerators, freezers, and air conditioners are not acceptable. The refrigerant in these is toxic to the environment. Do not throw food away in dumpsters. Most rental companies do not allow food waste in the dumpsters because it can attract pests. Mattresses usually are not allowed in a dumpster unless you pay an extra fee. Tires are not allowed in landfills in the United States. Local municipalities must handle tire disposal. Auto parts stores, tire dealerships, and mechanics can recycle old tires, usually for a fee. Batteries, such as car batteries and lithium batteries, cannot go into the dumpster. These batteries contain harmful chemicals that can leak into the ground and damage the environment. These batteries need to go to a local recycler. You can take car batteries to a local auto shop. You can recycle lithium batteries, such as those in laptops, at electronics stores. Full or partially full aerosol cans cannot be placed in a dumpster, no matter what they contain. Whether it is paint or cleaner, these do not belong in a dumpster and cannot go into a landfill. Glues, epoxy, and other adhesives need to be recycled. These things can't go in the dumpster, as loose adhesive can cause damage to the dumpster. Ink, such as that used in pens and printers, can damage the dumpster. These items should be sent to a recycling center. Chemical cleaners and solvents cannot be thrown into a dumpster. Empty cleaning containers can be thrown away but not if they contain residual chemicals. Railroad tires are often treated with a preservative that is harmful to the environment. Some landfills will take them if they are intact. Some organizations will also take them to reuse. Propane tanks, fuels, oils, and any other flammable materials are dangerous in a dumpster. This poses a considerable safety hazard, as these items are highly combustible. It is illegal in most areas to throw these away; they must be disposed of properly. You cannot throw hazardous materials and liquids in a dumpster. Things such as pesticides, asbestos, motor fluids, contaminated soils, and medical waste must be disposed of properly. These items are dangerous for the environment. Materials such as medical waste can even be infectious. The state regulates the disposal of any hazardous waste and will require you to follow a different procedure depending on your location. Some dumpsters are designed for recycled materials. This is an excellent option for companies that want to be eco-friendly and reduce their carbon footprint. With the movement toward being more Earth-friendly, this can be a selling point to attract more clients. 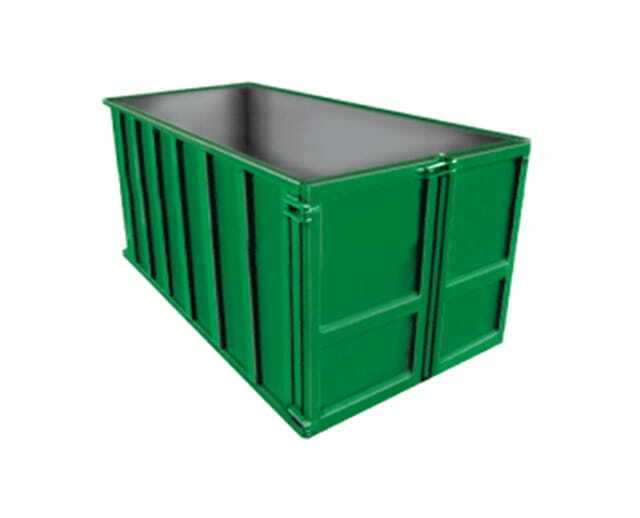 Dumpsters usually indicate which container is for which type of material. This means recycled materials should not mix with construction materials or yard waste such as grass, shrubs, and dirt. In some regions, recycling is not just a suggestion; it's the law, so make sure you understand the regulations in your area. Always separate your recyclables to be safe. When Do I Need a Dumpster? 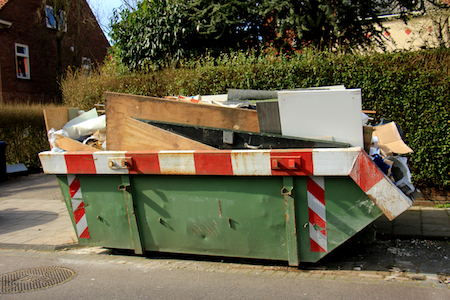 You'll need to rent a dumpster during most construction or remodeling jobs. Demolishing, renovating, or building a new site leaves a lot of construction material waste. In most circumstances, not having a dumpster on-site that meets the need of the job can cause delays in the project. These delays can cause the project to take longer than promised and lead to higher job costs. 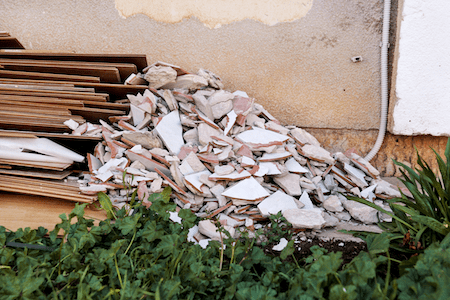 During home or business remodeling or renovations, you might need to rip out a lot of old materials. Whether the construction project is replacing water-damaged walls, carpets, and floors or updating a kitchen, these old materials need to be disposed of properly. Typical residential trashcans cannot hold this garbage. Just pulling out old floorboards to add new hardwood floors or removing cabinets produces too much waste for household trash to handle. Many residential trash companies cannot accommodate the amount of debris resulting from construction projects. If you don't have a place to throw these materials away, you can't continue work until you take the contents to a landfill. Therefore, a construction dumpster is a must on a work site. For many construction companies, renting a large dumpster during a project is more cost-efficient than buying one. Often, contractors create a long-term relationship with a dumpster rental company. Ask the company if it offers contractor's pricing or a discount for renting multiple dumpsters. When contractors rent frequently, this is a good relationship for both parties. Overall, dumpsters are safe when its users follow proper measures. Everyone on the construction site or who will be around the dumpster should use good common sense and follow these safety tips. Always use your personal protective equipment. Wear things such as gloves and eye protection when throwing waste into the dumpster. Wind can blow dust and particles into the air and your eyes. Remember that the dumpster might contain sharp materials that can cause deep cuts or puncture wounds. Prevent injury when throwing materials into the dumpster. Do not overfill trash bags or waste containers. If something is too heavy, have two or more people load it into the dumpster. Use the door to load the items instead of lifting them overhead. Do not throw things overhead. This can lead to shoulder injuries or even head trauma. Do not overload a dumpster. This can cause things to spill out and onto someone before the dumpster has been emptied. Overload can also cause things to come out during transport. Never stand on top of the debris in a dumpster. If things need to be rearranged, use a step ladder. Remove debris from around the dumpster, as this can become a tripping hazard. Do not stand near a dumpster when it's being delivered or lifted. Do not have a dumpster placed under electrical lines. Make sure the area where the dumpster is placed is well-lit. This prevents theft, arson, and littering. Renting a dumpster is often much easier than hauling in your own dumpster to the jobsite. Many contractors offer a variety of services. These services might include junk removal; repairing a home after a fire, flood, or other damage; or doing a renovation or other construction project. Other services might be more landscaping-focused. Each of these job types needs a particular type of dumpster. Dumpsters that hold recycling materials cannot be used for keeping yard clippings or dirt. Construction materials cannot be put in a dumpster with residential materials. Different jobs also need dumpsters of different sizes and types. It does not make sense to buy one size dumpster for a project, then have that dumpster be too small for another project. 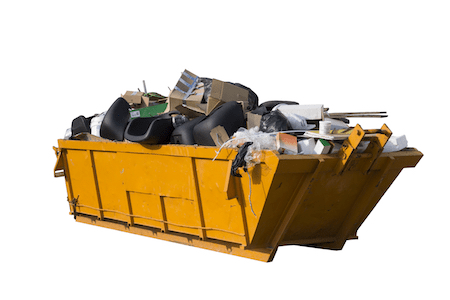 Contractors can save money in the long run by renting a dumpster. Because each type of job needs its dumpster, renting a dumpster is a more straightforward solution than trying to have a dumpster for each project type. Not only will the dumpster type vary but each one might require a different method of unloading. With BigRentz's large selection of dumpsters, you can find a dumpster for every job and almost every material. You can rent a dumpster for 28 days in most cases. Some locations require you to get a permit before placing a dumpster. These permits are generally easy to get from local agencies. There are many types of construction roll-off dumpsters available. Besides choosing a dumpster by size, it is important to think what will be going in the dumpster. This is important to consider because it can change the terms and conditions for that dumpster. By understanding the terms and conditions of the rental services, the process will go smoothly, and you'll avoid paying additional fees and overage charges. Not all companies are upfront about extra charges. Always ask about these before renting a dumpster. Although BigRentz has locations across the country, it is a local business. BigRentz offers roll off dumpster rentals to many local clients and provides an easier way to get the right dumpster for a job. Will the dumpster company automatically come pick up the dumpster? Some dumpster companies will show up at the end of the contracted time, while others will not arrive until you call them. What can go in the dumpster? As discussed above, there are certain things you can and cannot put in a dumpster, depending on the type of dumpster you rent. Check with the dumpster company if you have small amounts of things that would typically go into another type of dumpster. Also, if you throw items that don't belong in the dumpster, you could end up paying an additional fee. To avoid extra fees, be sure to know what can and cannot go in the dumpster. What is the weight allowance? For most dumpster rentals, the amount allowed is part of the price. For instance, with BigRentz, the renter chooses the dumpster size and weight limit and the type. This helps make sure they are getting the right size. With most companies, if you exceed the weight allowance, you will have to pay an additional fee. The fees can add up quickly with overages and be charged days or weeks after the dumpster gets taken away. Renting a dumpster is the fastest way to get rid of worksite debris, no matter the size of the job. 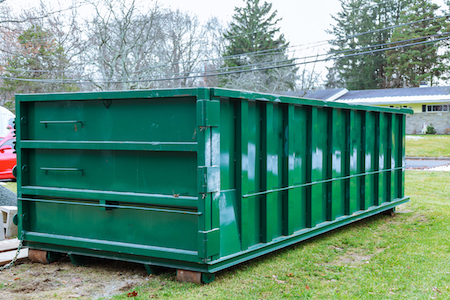 Renting a dumpster helps keep your project on track and avoids delays. BigRentz offers dumpsters that are the right size for small tasks, such as cleaning out a garage or an attic, as well as larger jobs such as demolishing a house. BigRentz offers dumpsters for residential materials, construction materials, and yard clippings such as dirt and shrubs. Because BigRentz also provides rentals for other construction equipment, it can be the one-stop location for all of a contractor's needs. With more than 8,000 locations, you're sure to have a BigRentz location nearby. Contact BigRentz today at (888) 325-5172 to get a price quote and discuss what kind of dumpster rental you need for your project and what size dumpster is best for the job.